Google Panda refers to an on-going upgrade of Google’s search results ranking algorithm. The purpose of Panda is to allow higher-quality websites to rank higher in organic search results while moving lower-quality sites down the list. To learn more, read our related Panda post about what Google Panda does and why it matters to your website. 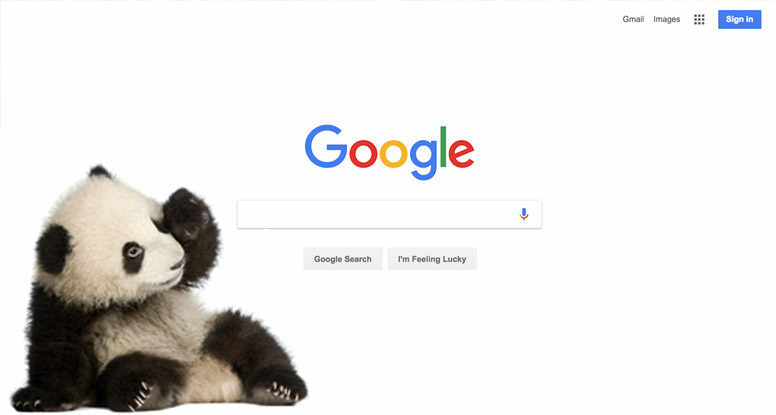 Panda is one of more than 200 signals Google uses to rank pages, but it’s a particularly important one for online retailers and any other businesses relying on organic traffic. Google’s goal with Panda is to improve search rankings and create a better browsing experience for everyone. Panda judges websites based on quality content as well as a formula involving a ratio of a site’s inbound links and reference queries. It looks at sites as a whole rather than only individual pages. That means even a few low-quality pages can drag down a site’s overall ranking so be sure examine all your content closely and update when necessary. Panda 4.2 is a relatively minor refresh in that it will affect only about 2-3% of English-language searches. That said, we’re still dealing with tens of millions of affected search rankings. And if your site is negatively affected by Panda, it probably means your content is currently of lower quality according to Google. The most important thing to understand about Panda 4.2 is its emphasis on quality content. What does that mean? It means professionally written content that cuts through the Internet noise and delivers the most relevant and useful search query results to users. It’s best to avoid automatically-generated content or content written by cheap copywriting mills with little grasp of sentence structure, style, or grammar. You may save money in the short term by relying on cheap writers or content farms, but you’ll ultimately get what you pay for. Remember that quality beats quantity every time in terms of both word count and total number of articles or posts. In fact, too much content can actually be a bad thing if it’s largely duplicated content, redundant, or just poorly written. How will Panda 4.2 effect my site? Be sure to closely watch your organic traffic and keyword rankings (which you’re probably doing already). If you see a deep dip in traffic or rankings it’s likely that Panda is punishing your site for poor content practices. What questions do your customers or clients commonly ask? What are the current issues affecting your industry and why should your customers care? What kind of content are your customers most likely to share? Do they prefer how-to articles, lists, interviews, Q&As, newsletters, or videos? Creating sharable content helps build in-bound links to your site thus improving your rankings while also being valuable to customers. How closely does my content answer specific questions and search queries? Also be sure to use long-tail keywords in your copy. For example, say you’re a furniture manufacturer or retailer. Instead of only using generic terms on your site such as “living room furniture,” use more descriptive and specific phrases like “mid-century modern entertainment console” or “rustic clear-finished walnut cabinet” or whatever best describes your product. This will help users find exactly what they are looking for since so many people are using long-tail searches when using Google and other search engines. Panda 4.2 won’t be the last update Google makes to the program. But by following these best practices you can stay ahead of the curve and keep your traffic and search rankings high.